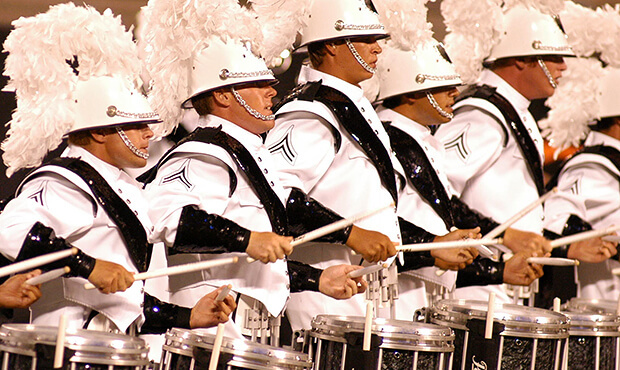 In 2003, the Drum Corps International World Championships returned to Orlando's Citrus Bowl Stadium for the fourth time, with the Individual & Ensemble competition taking over downtown Orlando and the Parade of Champions returning to Walt Disney World's Epcot. Phantom Regiment's 4th-place "Harmonic Journey" was an especially effective production that generated a great deal of reactions in the stands. The production, tracing the evolution of harmony and its impact on different styles of music, introduced a greater use of body sculpturing (such as knee bends and leaning) to the corps and softened the corps' visual image. The show opened with Johann Pachebel's "Canon in D," a work most often referred to as "Pachelbel's Canon." A canon is a composition device that utilizes multiple musical voices playing the same motif, but at different times. (Think of the round, "Row, Row, Row Your Boat.") It was a most gentle start of a Phantom Regiment show, which made it all the more dramatic when giant double flags popped up at the work's climax. Small chamber groups of instruments were scattered across the field, playing off one another as the piece evolved, maintaining a strict sense of harmonic consonance and filling the field with pure exquisiteness. The Pachelbel selection snuck into "Wild Nights" from "Harmonium." The piece by contemporary American composer John Adams was composed in 1980 for orchestra and large chorus and was based on the poetry of John Donne and Emily Dickinson. "Wild Nights" is the last of the three movements and is based on Dickinson's poem of the same name written in 1861, just a year before the famed poet became a recluse and practically disappeared from society. At the dramatic highpoint, Regiment's drum line, compressed into a tight triangular block, invaded and cleaved right through the horn line, dispersing the horns out of the way akin to bystanders running out of the way of a charging bull. By now the audience had figured out that combining Pachelbel with the tempestuous driving rhythms and cataclysmic percussion of Adams was like mixing oil and water. It shouldn't have worked, but it did, and therefore the next work also seemed to fit right into place. The third piece in the show was Miklos Rozsa's "The Lord's Prayer," from the 1961 biblical film epic, "King of Kings." (Rozsa is perhaps best known for composing the music for the movie, "Ben-Hur.") This lovely ballad built in intensity on the field to a big and stationary shallow horn arc, featuring the guard up front sporting either blood red flags or large flagless metallic poles. This ballad was one of those drum corps moments that drilled right through one's heart, but one couldn't quite tell why. The final musical selection was "Ostinato" from B?©la Bartók's "Mikrokosmos," the 146th work in a series of 153 progressive piano pieces published in six volumes. The individual pieces progress from beginner level to technical displays that would have made Chopin envious. Being that Regiment's selection came from later in the final book in the series, its origin is of one of the most technical of Bartók's works. An ostinato is a musical device that repeats often, usually on the same musical pitch. The word is derived from the Italian word for "stubborn," the equivalent of the English word, "obstinate." To this end, Regiment's rendition started with a frenetic repetitive drum pattern, with mallets re-creating the piano part. The horns continually built up the tension, and before harmony could be totally cast to the wind, a restatement of the Pachelbel "Canon" blasted forth in intense volume, leading up to a triangular block of horns that crab-walked to the side, a corps trademark. This crabwalk added a bounce step in the middle, which was most unexpected the first time it was seen. After heading into another block, the horns in the front paid homage to another of the corps' visual trademarks, kneeling down on one leg with the other one outstretched. Upon the conclusion, a lone guard member kept spinning her flagpole with one hand, as if not getting the message that the show was over. For this week only, you can save on the DVD that contains this complete Phantom Regiment performance, along with all finalists from the 2003 DCI World Championships. Buy the 2003 World Championship DVD set. (Available this week only for 20% off. Regular price: $39.95.) Discount DVD offer ends Monday, Sept. 15, 2014.